Oh, lord... a bridge galore! So wonderful to see Bangkok again - I will be returning soon to, I guess that bucket list thing has gotten stuck on a few places that I keep returning to, and I still want to return to. Hong Kong is one, and Thailand (in general) is another one. There is more than enough to see, despite having lived for decades in one of those places. The age of the overhead wires in Bangkok are luckily about to end. Sukhumwit Road is one of the first streets to have these underground - a mammoth task for a city like BKK if you ask me, but also a completely necessary things to have done. I'd spotted another brown board and headed for it, crossing the road from the temple to the canal side and before taking a photo of Wisukam Narueman Bridge. The board explained that the bridge, opened in 1901, had been ordered by King Rama V, and was initially an iron structure with a wooden pavement and cast iron blustrade. It was restored and reconstructed in reinforced concrete in in 1967. Certainly an essential improvent for today's traffic! Continuing energetically along a straight stretch of canal, I approach the next major road bridge. To the left of of the photo, the bridge takes the traffic along Samsun Road, and on the corner I spotted a suitable place to sit a while and enjoy a snack and drink. Resuming my walk, Wat Noranartsoontarikaram stretches some length the along the side of Krung Kasem Road, while the canal side is open space that appears to have been recently cleared. Looking at Google Street View it is lined with low buildings and market stalls. One can't 100% believe some of the dates Google gives, but in this instance May 2017, six months earlier than my visit, may well be likely. Farther along near the next bridge, street view actually shows some demolished rubble. Looking back and zooming in from the next bridge, this photo shows the cleared space on one side of the canal. The wall of the temple is glimpsed on the extreme right of this photo. Ahead are the locks and the Chao Phraya river. I was fortunate to see a boat exiting the lock - I later realised they had been clearing vegetation along the riverbank. ...and find the way to the temple whose glorious spire I'd glimpsed through the foliage. Indeed such explorations would bring me to the Dusit area. The canal I'd spent the day walking along is actually quite close at one point to a favourite temple, Wat Benchamabophit, which I've always approached in the other direction from the Skytrain. Gradually with each visit, the jigsaw pieces of ‘My Bangkok’ are fitting together into a bigger picture. But for now it was time to continue along 'my side' of the canal to reach Thews Pier from where I could go along the river by boat back to where I was staying at the Hilton Millenium Hotel. ...and finally I’'ll end this walk with a view of the impressive cable stay bridge across the Chao Phraya river - the Rama VIII Bridge. Ahhhh.... Bangkok, a city that will forever stay in my heart and a city where I have so many, many, many memories - good and bad! Once Bangkok gets under your skin, you'll never be able to leave. I agree! Each time I see a photo of places I have seen, so many memories comes back to mind. Earlier this month I came across a link to an article in Bangkok Post, the title "Bridging times and cities" grabbing my attention. One of the two cities mentioned was, unsurprisingly, Bangkok. The other turned out to be the Belgian capital Brussels where a bridge to aid traffic flow had been designed to be rapidly assembled in time for the famous World Expo in 1958. The viaduct then remained in use until the early 1980s when it was replaced by a tunnel and the disassembled structure stored away. The newspaper article goes on to explain the fascinating story of how the bridge came to be given to Thailand and reconstructed in Bangkok in April 1988 as a much-needed urban flyover at a frequently gridlocked intersection. When I first read the article, I hadn't immediately realised where the Bangkok location (described as "the Witthayu - Rama IV - Sathon intersection") actually was, until scrolling back to the photograph at the beginning of the article. Of course! ...the trees in the bottom left are a corner of Lumphini Park; Witthayu Road (more familiar as Wireless Road in English) continues at an angle across Rama IV Road as Sathorn (also spelt Sathon) Road, and the triangular shaped junction of Sathorn with Rama IV, bottom right on the photo, is today the location of the high rise, trendy 'designer hotel' SO Sofitel where I have stayed on two occasions. So of course I had to search my photo files for any relevant views! Hazy light and taken through double glazed bedroom windows from the hotel, but clearly showing the flyover bridge. In fact the pedestrian crossing on the old photo before the assembly of the bridge is still there, and can be seen on my photo. What I don't have are any photos taken at ground level, though I frequently crossed beneath the flyover to reach the corner entrance to the park. Traffic is building up on Rama IV Road at the time of day this photograph was taken. The land on Wireless road opposite the park is about to be developed as mega-project "One Bangkok", described as "Thailand's largest integrated development, set to transform Bangkok city-centre and become a new global landmark destination". My Bangkok, my Bangkok. I have so many memories from you: good and bad. But I remember only the good one's. I saw that article in Bangkok Post too (the "Bridging times and cities"). Very interesting and usually well composed. As I still have another two years of subscription to Bangkok Post e-edition, I keep on reading that paper every morning as my morning ritual. I can't afford reading the local paper Address for Trondheim, but I can afford the Bangkok Post. LOL. I'm so strange. Today I am remembering that it is exactly two years since the passing of King Bhumibol Adulyadej - Rama IX - on the 13th October 2016. So it is perhaps an appropriate time to continue this thread with gradual posting of images taken in November of last year - following the year of mourning and the funeral, and before the dismantling of the Royal Crematorium at the Sanam Luang ceremonial grounds according to Thai tradition. Without fear of being ridiculed, I still remember the sadness of those days when His Majesty left his beloved country. A video from my friends and family in Phatthalung, Thailand, created this video which both made me feel happy and emotional at the same time. How they celebrated this most special day. I really appreciated that you posted that link from your Thai friends and family in Phatthalung. So fitting a way to remember that anniversary, and watching it (several times already) made me feel both happy and emotional too. It also prompted me to think about how often I had seen images of His Majesty the late King Bhumibol Adulyadej involved in planting things, and that I should start posting my images from last November, 2017,with a couple that show the landscaping of the ceremonial cremation grounds which paid tribute to his environmental work. There was a rice field, vetiver grass, and also a Chaipattana Aerator - an invention for water treatment by oxygenation that the King patented. 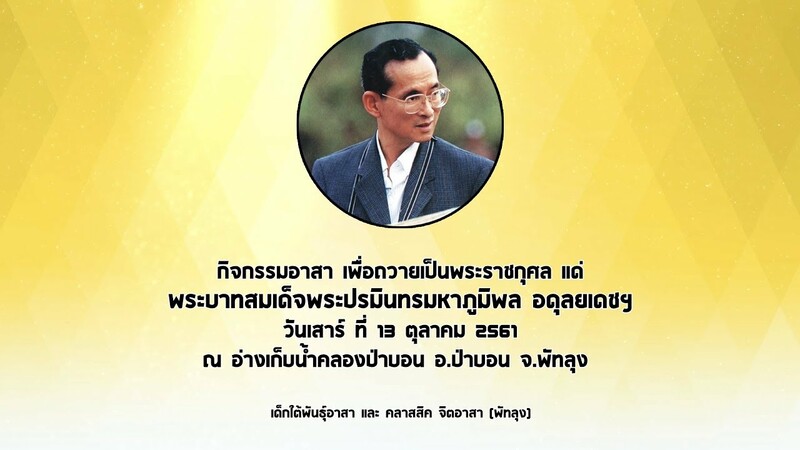 Yellow is the colour that represents Monday, the day on which His Majesty King Bhumibol Adulyadej was born.